I try to keep our lives as chemical free as possible and making the things Lil likes to play with is one easy way to accomplish this. 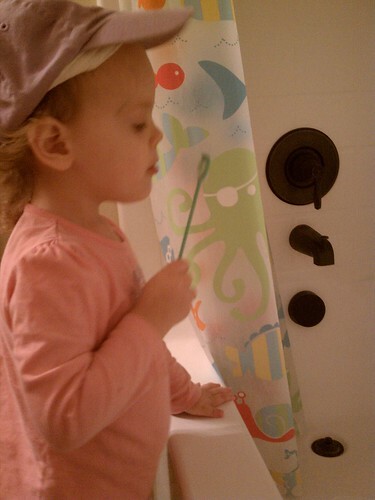 She loves to blow bubbles and we are just about out of the bubble solution that I bought last year so I started searching the grand interwebs to find homemade bubble solution recipes. From what I see so far they are mostly the same just the amounts very from recipe to recipe. They usually include water, soap and glycerine to give the bubbles strength I guess. Most of the recipes I’ve seen online call for Dawn or joy or some other main stream dish washing soap. We don’t have that on hand and using it would sort of kill the chemical-less aspect of this experiment. I do have Dr. Bronners castile soap so I used it. The recipes often call for distilled water, but I just used our purified water, I’m a rebel at heart. I don’t know what the deal is with distilled water and don’t feel like looking it up right now, I also doubt I’ll be buying a gallon of it anytime soon. I’m cheap like that and well lazy, mostly lazy and forgetful. Anyway, our water is purified and wonderful so that’s what I’ll be using for now. Our first bubble experiment was bust, pun intended. I’d say that the solution I made was about 10% successful. Which translates to a lot of wasted breath. If anyone is curious, and so I know what I did this time here’s what I used. Mix everything together gently until well mixed. Try not to make too many bubbles while doing this. That’s it. The positive of this whole thing was that Lily and I now have a problem to concur and we will and we had a lot of fun trying to get the bubbles to blow and mixing the solution. 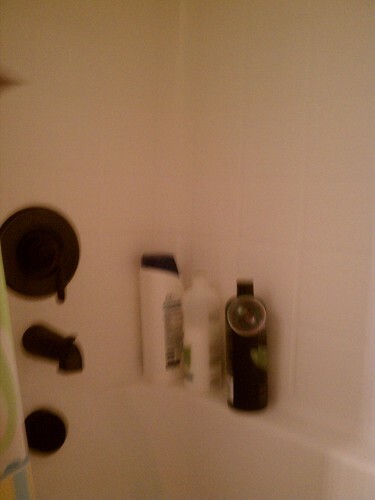 Sorry the pictures were taking with my phone in my oddly dark bathroom. YAY! One of the few bubbles. Next time I make them I’m going to use some of the dish soap my Mother-in-law gets at the health food Co-op. It bubbles like crazy and is very good chemical-wise. I think I’ll try different portions too. I am also on the hunt for good bubble wands. I need to find a wire hanger, but I don’t even know if those exist anymore. 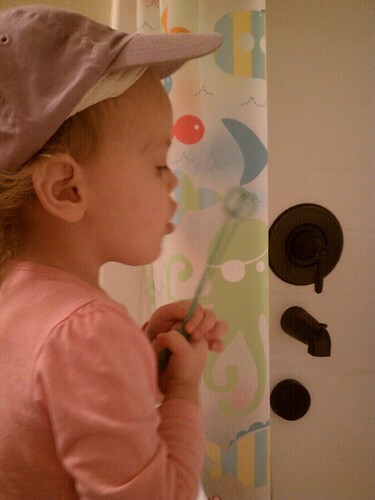 I hear that wire hangers and pipe cleaners make good bubble wands. We will find out.